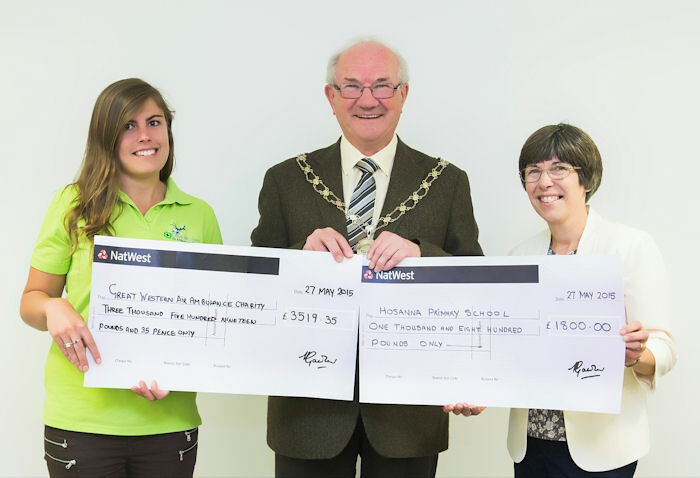 South Gloucestershire Council’s outgoing Chairman Howard Gawler marked the end of his year in office at full Council last night by presenting two cheques to the charities he has been supporting during the past year. A total of £5,629 has been raised through a variety of fundraising events – including a charity skydive – and went to the Great Western Air Ambulance Charity (GWAAC) and the Hosanna Primary School Support Group based in Yate which helps children at a school in Kampala, Uganda. The cheques were received by fundraiser Ella Mayne on behalf of GWAAC and Maggie Maclean who runs the Hosanna Primary School Support Group. Speaking at the council’s Annual General Meeting on Wednesday 27 May, Mr Gawler thanked all those who had donated to his chosen charities during the year and said he would personally double the amount raised which with Gift Aid would take the total to an estimated £13,000. He is succeeded as Chairman of South Gloucestershire Council by Cllr Erica Williams and Cllr Katherine Morris was elected to the role of Vice-Chair of Council. The Chair and Vice-Chair of the council are elected each year at the council’s annual meeting and represent the organisation at civic functions, as well as chairing meetings of full Council. More money came in after the cheques were written which will be donated to the outgoing Chair’s chosen charities but Ella at GWAAC is pictured (left) receiving a cheque for £3,519.33 and Maggie Maclean is pictured (right) receiving a cheque for £1,800 for the school support group.